SLN.090, SLN.180 and SLN.300 non-rotating nitrogen gas lifters provide an all-in-one lifter approach to guided lift applications. These lifters include built-in guidance for single, multipoint or rail lift applications and are ideal for progressive stamping dies. 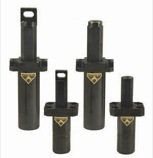 All three force models (0.1 ton, 0.2 ton, 0.3 ton) are powered by DADCO’s Micro or Mini nitrogen gas springs. SLC.500 and SLC.800 nitrogen gas spring lifters eliminate the need for separate guide and shock absorbing elements and provide stable lifting for rail applications. 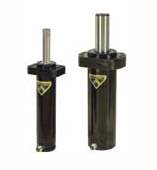 These lifters, available in two force models (0.24 ton, 0.8 ton), are supplied as linked units to provide uniform force for improved part handling and are ideal for progressive die lifter rails, work holding and balancing applications. SL2.090, SL2.180 and SL2.300 two post lifters are rugged and reliable. These lifters feature narrow profile rail plates (25 mm, 32 mm and 55 mm) for attachment and are ideal for progressive die lifter rails, work holding and balancing application. All three force models (0.1 ton, 0.2 ton, 0.3 ton) are powered by DADCO’s Micro or Mini nitrogen gas springs.